When you have young children under the age of three you could just wrap up a couple of empty cardboard boxes and maybe a wooden spoon or two but where is the fun in that. 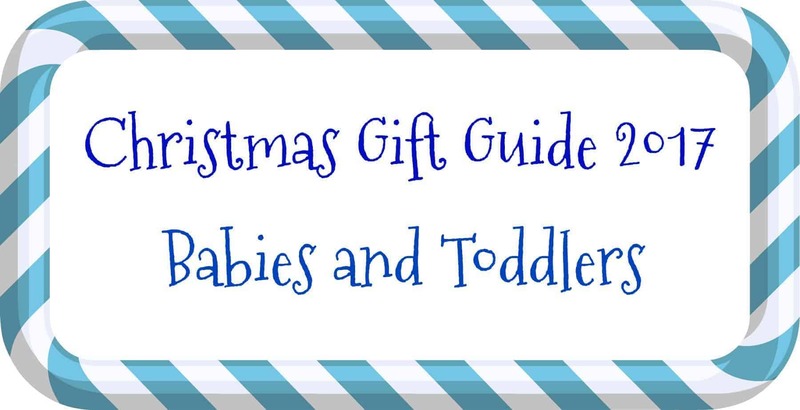 Below I take a look at some of the products that I have been sent for my Christmas Gift Guide that are perfect for babies and toddlers. Don’t forget to go all the way to the bottom to enter my competition to win a Lumie Bedbug. This microwave and dishwasher safe plastic crockery set if ideal for your little Twirlywoos fan and could even help with the fussiest of eaters as they have to eat the food to see their favourite characters. Available in Debenhams and Amazon this set is practical and fun. I am a huge fan of Blade & Rose but unfortunately my girls are way to old for them now. These adorable Christmas Gingerbread leggings are the perfect gift for babies. The super soft cotton-mix leggings are available in sizes 0-4 years. The red Christmas leggings are unisex so perfect if you know someone who is due to have a baby close to Christmas but you don’t know the gender yet. These super cute plush are perfect for babies and toddlers. The Classic Pooh designs means that these are timeless and will be something that can be kept for years to come. The Classic Pooh plush from Rainbow Designs are available in different designs and you can get the different characters in each design. This stunning Nibbling London teething toy from the new natural range looks fantastic. Made from a mix of natural untreated wood and turquoise silicone it feels amazing and you can tell that it is really well made and of a high quality. I loved rolling the silicone balls in my hand as it is very tactile. We love the Bladez toy products and this Teletubbies water filled play mat brings the joy of these products to a younger audience. Jump around on the mat and see all of the characters move in the water. Also great for younger kids for supervised tummy time. This mat is a massive 75cm diameter. Every child would be happy to find a new plush under the Christmas tree and this In The Night Garden Upsy Daisy Baby Soft Toy from Golden Bear is the perfect addition for your little ones. She is super soft and in nice muted pastel colours means that she is ideal for a snuggle at nap time. The bib of all bibs. Not only does this bib look great but it is practical too. Bibetta bibs are loved by mums who have used them in the past. With a pocket on the back which you can fold on to the front making a mess catcher and in an easy to clean material that still looks great after lots of washes this is perfect. Plus it will look super cute on Christmas day whilst tucking into your turkey. Toddlers absolutely love making up their own stories or reenacting stories they have seen on the TV so this In The Night Garden Double-sided Magnetic Play Set is absolutely perfect. The bright colourful pieces feature the well known characters from the show and are robust and easy to move. Mr Tumble is a huge favourite with toddlers and I can see why. This colourful character sings and dances and has light up cheeks which makes him lots of fun. Suitable from 10 months it is an ideal gift for young children who are just starting to love his show Something Special. I have to admit to being a big IgglePiggle fan despite the fact that my kids are a lot older now. This Peeking Igglepiggle holds his blanket over his eyes to play Peekaboo and I can just imagine the squeals of laughter that this will induce from a young In The Night Garden Fan. If you are looking to buy a beautiful keepsake then you can not go wring with this gorgeous BabyBlooms Christmas Breakfast set. This four-piece bone china breakfast set is perfect for a baby’s first Christmas. The set comprises of a bowl, plate, mug and egg cup and is hand decorated. This beautiful Christmas set is presented in an exclusive Babyblooms’ illustrated gift box which really adds to the gift. As huge fans (and users) of various Lumie lights I was very excited by this years launch of the Lumie Bedbug. The Lumie Bedbug promotes a calm bedtime and good night’s sleep for babies and young children. Lumie Bedbug uses low-blue light LEDs (the part of the light spectrum known to be stimulating). This 3-in-1 product combines a reading light with a sunset feature and nightlight. The light is fully adjustable and the 15-minute sunset can either fade to off or to a nightlight which has two light intensity options. You can win your very own Lumie Bedbug by filling in the rafflecopter form below. The prize is a Lumie BedBug as per the post.